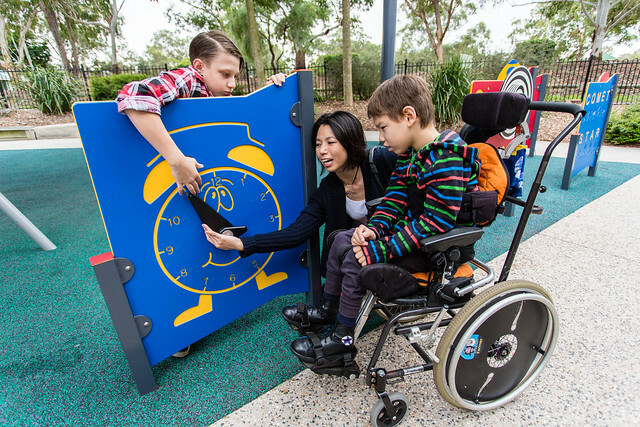 Brisbane City Council's playgrounds for accessible and inclusive play include a range of playground equipment, elements and features to accommodate different user and access needs. The 'play for all' spaces are designed for universal access - spaces for children to come together, interact and engage with each other side by side regardless of age or ability. Read about accessible and inclusive play equipment and view a photo gallery of this equipment in-situ in various Council parks. An accessible carousel is a high-backed merri-go-round where children can play together as a group. The design allows for wheelchairs to be locked in (with no need for transfer). A raised, accessible elevated play structure for large groups of children. Includes ramped access, sensory panels, slides, nets and poles to allow children of all abilities to play together. An accessible sand digger can be operated by (and accessed by) by children in wheelchairs to help improve hand/eye coordination and motor skills and encourage imagination. A transfer station allows children to transfer from wheelchairs into the accessible sand pit. An all abilities swing seat is an easy access swing for older children. Choice boards allow children of all abilities to communicate with each other and others. A double flying fox provides movement and social interaction opportunities for multiple users. Embankment slides allow for on-ground slides to encourage social interaction and provide opportunities for sliding. The five-way swing enables up to five children to swing simultaneously. This type of swing has specially designed seats to keep each child secure while swinging. A harnessed swing seat provides a harness to keep a child secure while they swing. The hammock swing allows users to sit or lie down in the swing. Interactive play panels are designed to build fine motor skills, while also encouraging passive and quiet play, and/or interactive and sensory play. Includes any rocker that can accommodate more than one person and/or a wheelchair. A multi-use spinner or multi-use spinning disc is a spinning dish that allows for multiple users at the one time. Users can transfer from a wheelchair to the spinning disc and can sit or lay on the disc. A swing that allows for more than one user at a time. Usually consists of a net suspended from a large swing frame. The nest swing provides fun for more than one child at once. A net structure allows for physical activities including climbing and traversing. Children can transfer on to the net structure from an accessible surface. Rubberised, soft wheelchair and pram accessible surfacing. A custom designed sand table allows access for all wheelchair types, allowing children to play with and mould sand. A sand/water play unit allows access for all wheelchairs to interact with sand and water to encourage social interaction and sensory plan. Sensory elements (materials and landscaping) in accessible and inclusive play areas are designed to stimulate multiple senses and enhance the diversity of the play space. Sensory panels may encompass a mix of tactile, visual and auditory play experiences. Sensory play activities help to promote social interaction between children and encourage exploration and discovery and the development of cognitive and motor skills. Spring toys are mounted on a durable spring and can generally be rocked in all directions. Spring toys help to develop motor skills. A standard sand digger can be operated by able-bodied children to help improve hand/eye coordination and motor skills and to encourage imagination. The wheelchair accessible swing, often referred to as a Liberty Swing, harnesses a child's wheelchair securely in the swing. View the 'accessible and inclusive play' photo gallery as a slideshow, or view photos individually within Council's Flickr account. You can also view all of Council's parks and reserves sets in Council's Flickr 'parks' collection.